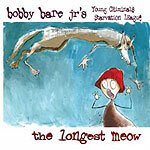 CD review: "The Longest Meow"
This review first appeared in Turbula in October 2006. Son of the late country legend of the same name, Bobby Bare Jr.'s muse is far too curious to be contained by a single style of music. Generally classified as "alt rock," even that rather nebulous description is too narrow to properly describe the range of music found on Bare Jr.'s latest release, "The Longest Meow." "Back to Blue," for instance, is as much Mexican norteno as anything else. "The Heart Bionic" is a cross between late '70s Kinks and mid-'80s British ska. "Sticky Chemical" is ... actually, it's hard to say just what that one is. Sounds like a tuba providing the rhythm, but none is listed  baritone sax maybe? Then the horns kick in and you stop trying to classify it and just sit back and enjoy how utterly captivating it is. But providing a sense of continuity is the quality of each of these very different songs: They're all well-constructed melodic little gems. In that blending of wonderful melodies and offbeat styles, Bare Jr.'s newest is more reminiscent of Frank Zappa than anything his father did.